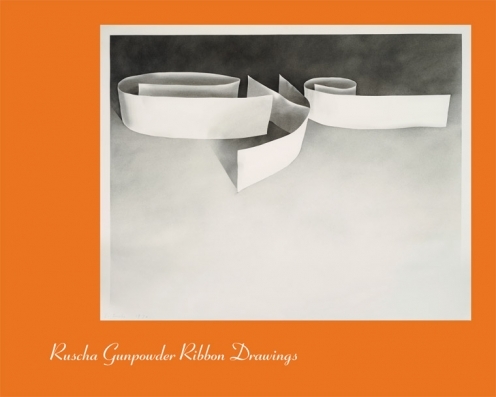 NEW YORK – Craig F. Starr Associates is pleased to announce the opening of Ed Ruscha Gunpowder Ribbon Drawings, October 24 - December 15. The exhibition presents a selection of Ruscha’s drawings from 1967-70 that feature single words depicted in a trompe l’oeil technique, as if the words are formed from ribbons of curling paper. The words are short and snappy, such as Quit and Eye, and by their removal from a linguistic context, they assume a new character – text becomes image, and image becomes text. The medium for each of these drawings is gunpowder, which is a combination of charcoal mixed with sulfur and saltpeter. This unusual medium, with its granular texture and connotations of war and violence, contrasts with the elegance of the carefully rendered words. Born in 1937, Ed Ruscha moved to California in the mid-1950s and by the early 1960s was well known for his paintings, collages, and photographs, and for his association with the Ferus Gallery group. His early career as a graphic artist has been an important influence in his aes- thetic approach, with motifs that draw upon a common vernacular of language and landscape. 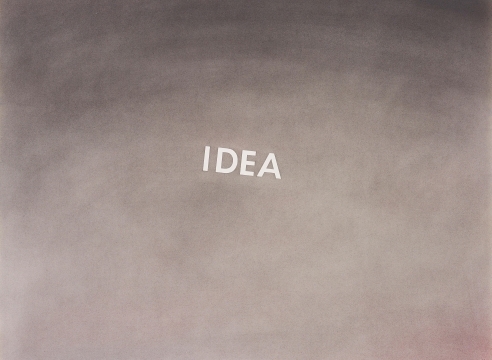 His work has been the subject of numerous gallery and museum exhibitions since the 1960s to the present, and in 2005, Ruscha represented the United States at the Venice Biennale. This exhibition is accompanied by an illustrated brochure with an essay by Cécile Whiting, Professor, Department of Art History and Ph.D. Program in Visual Studies, University of California, Irvine.